Snails have been on my mind a lot lately. 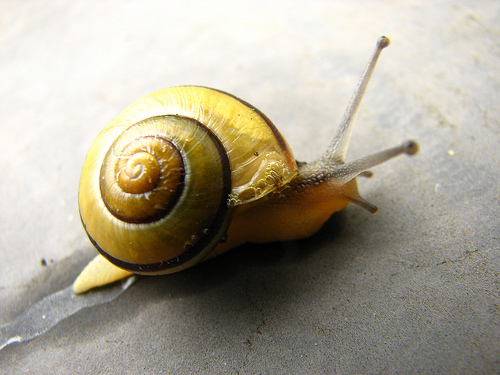 In fact, “snail” is probably a good metaphor FOR my mind lately: spirally and slow and withdrawn. Last month I wrote a poem, using the snail metaphor, that was accepted for publication in a literary journal called “Snapdragon” for their September issue. I have eaten escargot in Normandy, been amazed at the huge moon snails on the shore of the Salish Sea, been startled by the shell-less yellow banana slugs in a Northwest forest. Every morning when I wander out with my first cup of tea, I see new snail trails across the concrete walk in my front garden. Sometimes they are determinedly headed for a destination straight across the walk. Sometimes it’s clear that a snail has changed its little gastropod mind and circled back, and then changed its mind yet again, its little trail of slimy hyphens making loops of indecision. By morning the snails all have arrived wherever they were headed, and gone into hiding from the sun. A couple of weeks ago a friend gave me a beautiful little gem of a book called The Sound of a Wild Snail Eating. It took me deeply into the life of one particular woodland snail, and of the woman who observed it for over a year. This book, wonderfully-written by Elisabeth Bailey, taught me how amazing all snails are. My all-time favorite snail story happened about fifteen years ago when I received an official envelope from the Royal Mail in England. Inside the envelope was a letter professing, in an extremely proper British apology, that they were dreadfully sorry and did not understand how this could have happened, but that the enclosed piece of post, sealed in the accompanying plastic bag, had apparently, to their embarrassment, been eaten by snails. Again, they were terribly, terribly sorry, and wished me a good day. Inside the plastic bag was a letter, addressed to me from family in England and dated some four weeks earlier, with holes and paths dug by thousands of the little teeth* of a hungry, or inquisitive, snail. I laughed out loud when I realized that this gave a whole new meaning to the phrase, “snail mail”! And right now I feel the urge to emulate my little fascinating friends. I’m going to curl up and perhaps digest today’s mail while I take a wee nap.